Download PDF for poster: picture by Alex Haslam. Does your work lend itself to a striking visual image? E-mail [email protected] to feature in ‘Big picture’. 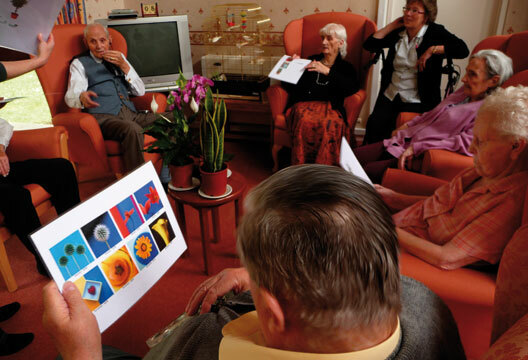 Moving into a care home can be an extraordinarily stressful experience. The transition often involves moving from a place which is a powerful expressionof a person’s identity into an environment that has little personal meaning and where ties to others are weak: from a place in which one feels ‘at home’ into a home where one feels out of place. Researchers at the University of Exeter – Catherine Haslam, Craig Knight and Alex Haslam – have recently investigated this process, combining insights from social psychological work into social identity with neuropsychological insights about memory and attention. In particular, they have sought to show that the transition can be made less stressful by creating new social identities for residents that centre on their relationship to the physical environment. In an study published last year in Ageing and Society, the researchers found that empowering residents to make collective decisions about the décor of a home into which they were about to move had a positive and dramatic impact on their health and well-being. Residents not only felt a strongersense of shared identity with staff and fellow residents, they were less stressed and used communal spaces far more. In a follow-up filmed as part of the BBC1’s The Science of the Young Ones, residents who made decisions about redecoration as part of design teams (pictured)used their lounges nearly four times as much as those who were not involved in such decisions, and their performance on cognitive tests was around 20 per cent better. These findings are currently being used to inform best practice in care home management.